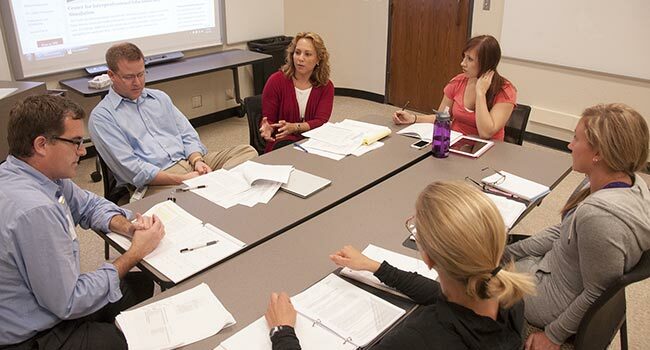 The Masters of Health Professions Education (MHPE) provides an educational research foundation for teaching, assessment and leadership in health professions education. The MHPE curriculum is comprised of twelve courses which focus on the application of learning principles to educational practice. All courses emphasize an applied project based on students’ professional experiences. The educational portfolio serves as an integrative tool across courses, and as a showcase for student accomplishments. Interprofessional–For all health education professionals. Educational research foundation–Evidence-based decision making. Application–Based on solving real instructional problems in health professions education. Professional Portfolio–Documents learning goals and accomplishments. Summer Health Professions Education Mini-Conference–Student-facilitated health professions education conference. Understand and apply educational research in health professions education. Design evidence-based educational programs and materials with appropriate scope, sequence, and focus for learners. Deliver effective, theory-based instruction in large group, small group and clinical settings. Effectively use assessment tools to reflect student progress and to promote student learning. Provide reflective and evidence-based leadership. Develop cultural awareness and commitment to diversity as linked to practice in all aspects of health professions education. Contribute to excellence in health professions education and advancement of the health professions education community.